Desktop and floor standing world globes, illuminated globes, raised relief, floating / levitating, celestial, Moon, Glowing globe and self-spinning globes. 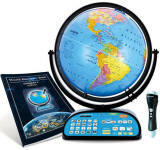 Safari Globe Atlantis 12" Globe Anti-Gravity Globe Explorer 12"
Apollo Hastings 12" Globe Pioneer 12" Globe Starlight 12"
1 box of 12 pc. Constellation 12 illuminated Lenox 12" World Globe Adventurer 12"
Desktop and floor standing world globes, illuminated globes, raised relief, floating / levitating, self-spinning, celestial, Moon, Glowing globe and Mova solar powered globes.